Sick of seeing graffiti plastered all of your home or commercial building? No one wants to have to deal with graffiti on their home or business, and that’s especially true when it comes to the windows. While it’s not always easy to get graffiti off of walls, it can be even trickier to get it off of windows, and that’s why window graffiti removal also isn’t cheap. 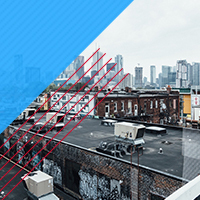 When it comes to graffiti, prevention is the way to go, and luckily, there are lots of things you can do to prevent your home or commercial building from being graffitied. Limiting access to your walls and windows is a great first step in preventing graffiti. After all, they have to be able to physically access your building in order to graffiti it. You’d be surprised at how effective a few, well-placed bushes, trees or other plants can be at preventing access. Additionally, no graffiti artist wants their masterpiece covered up, and having plenty of plant life in the way will dramatically reduce the visibility of their canvas. Plants aren’t the only things that you can to use to deny access to people trying to graffiti your building. You can also create a barrier to your building with a fence or a wall. The only downside to using fences and walls as barriers, is that they could be graffitied, too, but at least your building will still be protected. Many people see graffiti as art, and others see it as simple tomfoolery. But, no matter what you call it, it’s still a crime. Under New York State Penal Law, graffiti is considered to be Criminal Mischief, which is a Fourth-Degree: Class A misdemeanor. Don’t let people who vandalize your building remain anonymous. Install a security camera to catch them in the act. Security cameras are more valuable than just catching someone vandalizing your property; however, they’re also valuable in preventing vandalism. 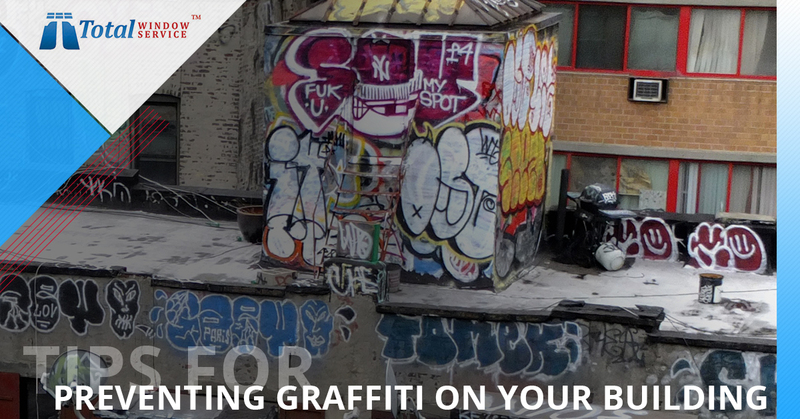 No graffiti artist wants to be caught, and a visual security camera on your property makes a great deterrent. As we mentioned, no graffiti artist wants to actually be caught vandalizing your building. No matter how proud they are of their work, it beehoves them to stay anonymous. Having a flood light will literally shine a light on any graffiti taking place on your building, and it will make it difficult for anyone to get to your building and vandalize it without being seen. There are a few different options of protective paints for preventing graffiti. These paints provide a barrier between your building and the graffiti, and many of them make it easy to simply spray or wipe the graffiti off. There are a variety of different paint options available, and using these kinds of paints is an ideal way to prevent permanent damage on your walls caused by graffiti. Protecting your windows from graffiti can be tricky, but luckily, there’s a magnificently easy solution — anti graffiti window film. At Total Window Service, our window film protects against more than just paint graffiti. It also protects against key scratching, acid etching and marking. It even protects against non-graffiti-related damage too, like construction debris and glass oxidation. Take the first step towards protecting your windows from graffiti. We hope that this blog has given you some ideas on how to prevent your building from being graffitied. And, while, here at Total Window Service, we can’t provide you with protective paint, flood lights, plantlife or security cameras, what we can provide you with is high-quality window film in New York City. Best of all, our window film comes with a lifetime warranty! Contact us today for your free quote!